1960's vintage A-line satin cocktail dress. 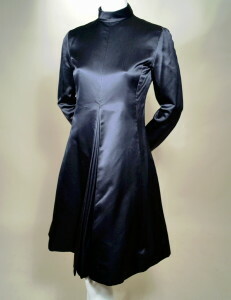 Black silk satin and black lining silk. Standing band collar. Princess seams. Long tapered sleeves with five (each) self-covered ball buttons and loops at wrist. Double inverted pleats at center front. Seam pockets left & right at hips. Two self-covered buttons and loops closure at neck back. Center back hand picked zipper. Full silk lining and interface lining. Finest quality construction... cannot be overstated! Chester Weinberg studied at Parsons School of Design, then started career on 7th avenue with Harvey Berin, Herbert Sondheim Patulo-Jo Copeland etc. Starting 1963 he worked at Teal-Traina for 10 years. By 1966 he had started his own label. Chester Weinberg closed in 1975 and by the 80's he was design director at Calvin Klein. Amelia Gray's boutique was where James Galanos first started dressing a young starlet, Nancy Davis (Reagan), in the 1950s. Center back length (from neck seam to hem edge) - 37"
EXCELLENT condition. Shows some surface fiber scuffs at underarm seams, fold line at cuffs and light wear at hem edge. All issues are minor.